LENNY ANTONELLI takes a ten hour trek through the wilderness of north Mayo. 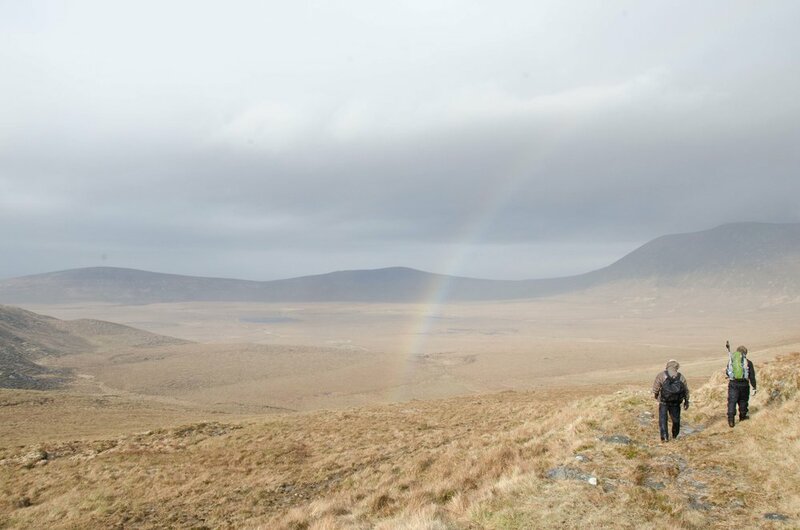 FOR CENTURIES FARMERS used the Bangor Trail to take livestock through the Nephin Beg mountains and the vast Owenduff bog, now part of Mayo’s Ballycroy National Park. Irish naturalist Robert Lloyd Praeger described this landscape as “the very loneliest place in the country” in his 1937 book The Way That I Went. “The hills themselves are encircled by this vast area of trackless bog,” he wrote. “I confess I find such a place not lonely or depressing but inspiring. You are thrown at the same time back upon yourself and forward against the mystery and majesty of nature.” We park beside the bothy – a stone shelter for hikers – at Letterkeen Wood, north of Newport. Many walkers begin in the town, but the trail from there is mostly on-road. From Letterkeen it’s 25km of wilderness before we’ll hit Tarmac again. Many walkers loop back to Letterkeen at the end of the plantation but we carry on past Nephin Beg mountain, crossing nameless streams that feed the bog. Scots pine trees once covered this land, but about 4,000 years ago Ireland’s climate grew wetter. Heavy rainfall washed minerals down through the soil, waterlogging the land. Mosses took over, bog formed and the forest withered. We take a detour for lunch to the Scardaun Loughs in the valley between Nephin Beg and Slieve Carr. Heading back to the trail, we cross a ravine sheltering a lone oak tree. “The only tree on the Bangor Trail,” Murphy says. The trail skirts the edge of Slieve Carr, known by hikers as Ireland’s remotest mountain, and passes the stone ruins of old farmsteads. Ravens circle overhead. “I’ve never seen the trail this dry,” Barry says. This provokes laughter, as we frequently plunge shin-deep into the bog. The trail is as wet as it is remote. Barry says the biggest mistake hikers could make is to try and save time by walking straight across the bog – those who built the trail kept it high enough to avoid deep bog but low enough to prevent needless climbing. The terrain varies from rocky to extremely wet, and at points it’s hard to follow, making navigation skills vital. Timber and stone tracks are now being laid on parts. We emerge into the desolate Tarsaghaunmore valley, with the river meandering across the landscape. A small farmstead in the distance provides the first sign of modern civilisation we’ve seen for hours. Because of our late (9.30am) start, we’ll be hiking the last few miles in the dark. We put on headlamps to tackle the last low hills as the lights of Bangor Erris appear in the distance. Exhausted, we reach a road outside the village after 10 hours hiking. Tackling the Bangor Trail is a serious task, particularly in winter. It demands experience, willpower, and the right gear. But the effort expended will reward you with a breathtaking trek through one of Ireland’s last wildernesses. Start: Brogan Carroll bothy at Letterkeen Wood, 12km north of Newport, Co Mayo. Leaving Newport take the N59 towards Achill and turn right after 1km at the sign for Bangor Trail/Letterkeen Loop. Follow for 10km until Letterkeen forest, then continue to follow Bangor Trail/ Letterkeen Loop signs to the bothy. Finish : Bangor Erris village. Leaving a second car here before the hike would be ideal, but we left bicycles in order to cycle back to Letterkeen the next day. Route: This is not an official waymarked way, but there is some sparse marking on the trail. At grid reference F889131, make sure to turn left to follow the stream as directed by the marker, rather than following the track off to the right. Not all streams along the way have bridges, and some may be difficult to cross after heavy rainfall. Suitability: Strenuous. Physical fitness, good hiking boots and rain gear, warm clothing, plenty of food and water, hiking experience and navigation skills all essential.